As if the catalogues were not bursting to the seams with complete Beethoven symphony cycles and a plethora of highly recommendable individual releases, Hyperion has now added its own. Mackerras has already, and relatively recently, recorded an excellent cycle with the Royal Liverpool Philharmonic for EMI (Classics for Pleasure 575751-2; review). Hyperion has a reputation for generally avoiding the central repertoire in favour of more obscure fare, and so the announcement of this release came as something of a surprise. We are constantly being told of the impending demise of the classical recording industry yet also comforted by the knowledge that labels such as Hyperion will continue to generate a market for their releases due to their enterprising approach to artists and repertoire. Quite where a Beethoven symphony cycle conducted by a man who already has an eminently recommendable set to his name fits into their strategy I was not quite sure. What we are presented with here is, I believe, something of a unique proposition. These performances were given live at the Edinburgh Festival in September 2006. Each symphony was presented on its own in early evening concerts, to wide critical acclaim, and broadcast by the BBC. Hyperion have now licensed those radio tapes and released them at mid-price. Interestingly enough, in terms of budget priced sets, the earlier Mackerras is in direct competition with David Zinman’s groundbreaking Arte Nova set (Arte Nova 74321 65410-2; review). Zinman was the first to record the cycle in accordance to Jonathan Del Mar’s recent critical edition of the symphonies. Much flag waving and sounding of fanfare accompanied the individual releases of Zinman’s cycle, rather eclipsing the roughly contemporaneous Mackerras recordings. What very few mentioned, however, was that Mackerras had been using the fruits of Del Mar’s research for quite some time and that Zinman merely beat him in terms of authenticity by being able to say that he was using the latest published research. Zinman, obviously wanting to stress novelty value above artistic integrity, proceeded to litter his performances with outrageously exaggerated effects within the context of an extremely bland approach to dynamics. Mackerras could never be accused of lacking artistic integrity, and this set is a fitting summation of his many years of experience. I will say immediately that this latest cycle is perhaps the finest that I have heard, if such a statement does not appear absurd. For here we have all the gains of historically informed performance and up to date research without the studied caution that so many conductors have brought to the period performance movement in recent years. If you were not aware of the provenance of these recordings you would certainly not guess their conductor. Mackerras conducts these works with an awe-inspiring energy and sense of discovery. 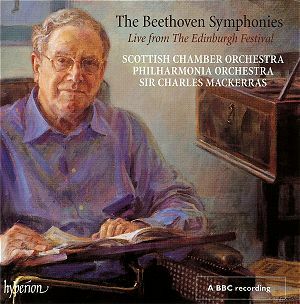 We will never know exactly how Beethoven intended these symphonies to sound, but I’d wager that Mackerras comes closer than most to conveying the originality, temperament and sheer humanity of the composer’s vision. Mackerras used his Scottish Chamber Orchestra for the first eight symphonies. As recorded here, the brass are extremely prominent (too much so for many listeners I imagine) as are the timpani (hard sticks, of course). Vibrato is kept to a minimum but not prohibited. The overall orchestral sound is explosive, vibrant and occasionally strident. Internal balances are immaculately controlled. I do not intend to give a blow by blow, movement by movement account of these performances; much of the joy that I have experienced in listening to them is a result of pleasant surprise. But I will attempt to give a general overview of each symphony so that readers will have some idea of Mackerras’s general approach. The First Symphony is given a relatively ‘straightforward’ reading; that is not, of course, to say that it is in any way dull, merely that Mackerras understands that this is not exactly Beethoven at his most revolutionary. It is an approach that works, as it would in any other ‘minor’ masterpiece - such as Schubert’s Fifth, for example. The opening of the first movement struck me as surprisingly broad and led me to think that this was going to be, shall we say, a more ‘mature’ mans cycle, such as Colin Davis gave us back in the mid-90s with the Dresden Staatskapelle (a personal favourite and still, I believe, available in all its granite hewn glory on Philips 446 067-2). First impressions can me misleading and such is the case here. The pace certainly picks up once Mackerras reaches the main allegro section of the movement, but I don’t think he drives the music too hard in the manner of Zinman, Harnoncourt and, I’m afraid, Gardiner. What we hear is a sensible rendition of this music that merely treats it with the respect it deserves, imbued with a great regard for tasteful levels of contrast and clarity of balances. To describe Mackerras’s approach to the second movement as ‘Mozartian’ may be indulging in cliché, but that is exactly what we get; grace and refinement are the key notes here. The ensuing Menuett is taken at quite a pace but is once again expertly articulated and balanced, and with thunderous timpani where appropriate. The final movement is once again fleet without being over-driven. Some may prefer greater weight to the orchestral sound, and I certainly would have welcomed a sense of sostenuto to the sforzando minims. Truth be told, Mackerras’s performance of the Second Symphony displays many of the same virtues. Again, tempi are swift without exaggeration, and the extra space given to the third movement Scherzo allows more spring and lift to the rhythms. I was expecting this approach to be less successful in the ‘Eroica’ Third Symphony. Yet in the first movement Mackerras takes what strikes me as being the ideal tempo, charting a middle course between the electrifying scramble of Gardiner and the broader, more graceful bluster of the ‘old school’ for which Klaus Tennstedt’s 1994 live traversal - a recording I will return to shortly- is an exemplar. Mackerras is expressive without being indulgent and the movement really does have a balletic feel, as sense of schwung that has eludes so many in the past. Obviously no historically informed performance with a reasonably sized orchestra is going to be able to create the sense of tragedy at the opening of the Marcia Funebre that you get with a Furtwangler or a Karajan. Yet Mackerras, by virtue of taking a swifter tempo and encouraging his string players to play with minimal vibrato certainly creates a chilly effect. This works marvellously when contrasted with the brighter passages later on in the movement. The finale goes off like a shot and is certainly among the most uplifting Beethoven performances I have heard, capping an exceptionally fine recording of this work. In the final analysis though, I did find something lacking here. There are depths to this music that historically informed performances prohibit and, though I certainly can’t use that as any kind of justifiable criticism, I would have perhaps expected Mackerras to indulge himself a little more here and there. My case in point is when the music of the last movement slows down to reflect on what has preceded it. Mackerras, very reasonably, sounds like he’s stood at the summit of an alp and admiring the awesome view, which is probably what the composer intended. In the aforementioned Tennstedt performance (available coupled with the Sixth and Eighth, EMI Gemini 371462-2; review) you get the impression that the conductor is gazing out over eternity, reflecting on a life beset by most of the greatest political and social upheavals of the twentieth century. Tennstedt’s music-making was informed by horrors that Beethoven had probably never contemplated; he once described the first movement of Mahler’s Sixth Symphony as predicting the Nazi menace. The problem of historically informed performance is that it leads to a kind of ‘museum culture’; in the pursuit of knowledge I would quite happily listen to a Beethoven performance exactly as the composer intended it. But I would listen once, maybe twice, and then move on, just as the world has in the past two hundred years. In fairness to Mackerras his is pretty much the only performance of this work that, for myself, presents an accurate image of the work as Beethoven intended whilst expressing some of the loftier ideas of some of his contemporaries. That in itself is a remarkable achievement and it is only personal taste that prohibits me from recommending this as the ‘Eroica’ of choice. No such qualms about the Fourth Symphony, or in fact the Fifth, both of which receive blistering accounts. I don’t think I’ve heard a finer performance of the earlier work, whilst its famous successor certainly ranks with the greatest recordings. In the first movement of the Fifth I felt that Mackerras’s lightning pace robbed the music of a certain amount of buoyancy, and there is a definite feeling of a triplet rhythm to the iconic opening gesture. Yet the ensuing movements pack an enormous punch, the Andante particularly well paced. Throughout this work, Beethoven plays on the contrast between the nihilistic, descending motif of the very opening and its optimistic, ascending equivalent (heard most obviously as the upbeat to the first theme of the second movement); many conductors highlight this struggle simply by beating the listener over the head with as many extremes of dynamic as possible. Mackerras is content to play out the musical battles at the heart of the work with an intellectual rigour which is supremely satisfying. No more intelligent reading of this difficult symphony exists on record and it is certainly instructive to compare it with the recording by young firebrand Gustavo Dudamel (DG 4776228; reviews); the Venezuelan conductor is superficially exciting, yes, but listening to Mackerras only goes to highlight what decades of experience and academic study can add to a performance. I was expecting the Sixth Symphony to be a disappointment. It is the one symphony of the entire cycle that I feel really needs a warm, ‘traditional’ orchestral sonority. It is the most gentle of these works and I initially felt that the timbre of the Scottish Chamber Orchestra would be unsuitable to reaping the extraordinary riches of this work. Happily I was mistaken; Mackerras tones down the more abrasive qualities of the earlier performances to give a truly rewarding reading of this score. Once again, though, personal preferences preclude making this a first choice. I don’t think anyone who has heard Carlos Kleiber’s recently unearthed live recording - remarkably the only time he ever conducted it - will ever forget it, and for me every performance of the work that I hear will struggle to compete with it. The true mark of a great performance is how the audience respond to it; on the Orfeo release of Kleiber’s performance (Orfeo C600031B) the applause is retained. The nature of that applause is in itself remarkable. The audience, obviously mesmerised by the performance, are initially reticent. After a brief silence, a few members tentatively begin to clap but, realising that the other occupants of the Bayerische Staatsoper are still in a trance-like state of absolute pleasure, cease. After a few more seconds of silence the house erupts. At the end of Mackerras’s performance I was wishing that I had been present on that afternoon in Edinburgh; at the end of Kleiber’s I felt like I had been transported to Munich on a lovely summer’s afternoon - the performance was actually given in November 1983. The only performance on the Seventh that touches me more than Mackerras’s present one does so for very different reasons. Leonard Bernstein’s final concert (with the Boston Symphony) is one of a kind. The tensile strength of his vision, so unfashionable these days, takes the breath away and, in the Allegretto, you can almost feel the chill of death in those horribly protracted pauses that Bernstein introduces. Happily Mackerras’s performance of the same work is altogether more enjoyable. In that same Allegretto movement the antipodean conductor (at a much swifter tempo) still manages to convey a sense of depth, but the major-key interjections are carried more successfully by the more suitable tempo. The lack of vibrato at the start of the movement aids the generation of atmosphere and the long crescendo thereafter, so difficult to bring off, is a model of control and a clear indicator of years of experience. In my mind only Haitink, at a Proms concert with the Berlin Philharmonic several years ago, has managed the same feat. Beethoven certainly knew what he was doing when he wrote that crescendo, but may have been a little naïve in terms of the practicalities of executing it. This has always been a favourite symphony of mine, with its combination of geniality and visceral excitement. Wagner, famously, referred to it as the ‘apotheosis of dance’. That said, I’ve never heard a satisfying performance of it. The tempi were always wrong and, if they weren’t, the textures were too heavy… The closest I’ve heard to perfection recently was at the hands of the aforementioned Dudamel, who at least had something interesting to say. I recall a conductor of mine once praising to the hilt a recording of the aged Stokowski conducting this piece, sighting the absolute rhythmic rigour as the reason for its success. That’s what Mackerras gives us here, and a great deal besides. Tempi are not especially quick, but textures are so clear that it feels like you’re looking at a new restoration of the Mona Lisa only to find that her drab green frock was actually dazzling emerald. That is Mackerras’s great achievement here, a truly enlightening reading, revolutionary without having to resort to point-scoring. What attracted me to that Bernstein recording was that the stoic act of absolute conviction in the music even at a remarkably slow pace spilled over into exultation by the end; Bernstein presented a struggle of such cosmic dimensions that you couldn’t help but be engulfed in it. Mackerras gives the exultation without the struggle and that, for me, represents the best of all possible worlds. My only slight reservation is that I would have welcomed more breadth to the trio sections of the third movement. It is that thing with the Alps again … Mackerras sounds like he’s going for a brisk walk; I think Beethoven was probably thinking a little taller. Once again, the Eighth Symphony is given a truly exceptional performance. Anyone knowing this work will hopefully have gathered from my previous comments that Mackerras’s general approach to Beethoven as evinced in this set is perfectly suited to the ‘little’ Eighth Symphony. It is a lovely performance, and the opening of the second movement has never sounded as Rossinian as here. For the Ninth Symphony Mackerras chose to use the Philharmonia instead of the Scottish Chamber Orchestra. I can see his point; the loftiness and progressive thinking behind the work do require larger forces. What one has to weigh against this is the obvious inconsistency in timbre between the previous eight works and this final, monumental one. There is also that fact that it becomes very clear quite early into the first movement that whilst the SCO performances were borne of a familiarity between conductor and orchestra honed over many years the Philharmonia Ninth was probably a little more ad-hoc. The results, while undeniably exciting, can seem a little crude. The first movement is taken quickly enough for it to sound hurried, and ensemble is not always as polished as we are accustomed to. Not so long ago Haitink gave us big-band Beethoven that more successfully integrated period practices with ‘old-school’ tendencies (LSO 0598). And yet…Mackerras elucidates so much detail within Beethoven’s orchestration that the experience is absolutely electrifying. If the conductor was trying to demonstrate just how revolutionary this movement was at the time of its composition then attention has been paid. The molto vivace second movement is not quite as extreme in tempo as its predecessor and yet still generates considerable excitement. The third movement hears the Philharmonia as you do not normally expect them to sound; Mackerras’s ‘sparse vibrato’ policy applies even here. More than at any point within this new cycle here sense a level of engagement with Beethoven’s music that transgresses sublime and moves on to realms of achievement that are rarely heard in the concert hall let alone on record. Several years ago, Simon Rattle in his television series ‘Leaving Home’ equated the passing of time in this movement to the ticking of a clock, corresponding with a fundamentally human instinct. Mackerras provides us with a convincing musical argument to back up Rattle; this really is music making that penetrates the soul and reminds us what it is to be human. The belief in the spirit of humankind has always attracted me to the finale of this symphony. Some have expressed bewilderment in its apparent lack of formal unity; this I have excused on the basis that it is composed around the structure of Schiller’s text. Others have adopted it for more sinister purposes. George Steiner once informed me that in the sketches for Theodor Adorno’s (unfinished) book on Beethoven he had circled a passage of Schiller’s prose referring to brotherhood and written the name ‘Hitler’ beside it. Without wanting to pass judgements on the activities of various conductors during and after the Third Reich, the teutonic quality of many Beethoven performances after the Second World War can largely be seen as due to influence of conductors such as Fürtwängler, Karajan and Böhm, none of whom were completely innocent of collaboration. One only has to look at Karajan’s Unitel film of this particular work (DG) to see how, consciously or not, Beethoven’s humanitarian spirit had been grotesquely transformed into some kind of proto-fascist rally. If you don’t believe me then borrow a copy and witness regimented lines of choristers with immaculately coiffeured appearances participating in probably the most joyless ‘Ode to Joy’ of all time. Bernstein, of course, was the conductor of the most obviously political performance of this work, on Christmas Day 1989, drawing together musicians from the four nations that were united after the fall of the Berlin Wall (Britain, America, Germany and Russia). Bernstein was already ill and, despite dubious political choices in the 1970s, chose this work above all to express the feeling of optimism and faith in humanity that was fitting for such a land-mark occasion. Fittingly he chose to replace ‘Joy’ with ‘Freedom’ (ironically Schiller’s original intention), which not only added a greater vibrancy to the vowel sounds of the choral lines but also provided the Western world with one of its truly iconic musical moments. No-one who saw the broadcast of those concerts on TV or who have heard the CD are likely to forget the impact of having an already iconic piece of music sum up an entire period of political history. So, where does that leave Mackerras? Well, I doubt that I have ever heard a more moving, exciting, optimistic performance of this movement. There may not be the political, historical or emotional ties of that Bernstein performance, and yet Mackerras is absolutely in-tune with Beethoven and Schiller’s message. This is about as humane a performance as you are likely to hear. Rarely have I heard a performance of anything that embodies such optimism and faith in humanity. That is certainly a comment I can make about all of the performances in this set. To have the greatest works of one of our finest composers conducted with such understanding by one of the late-twentieth century’s finest and most enquiring conductors would be a privilege even at full price. At Hyperion’s modest price tag this is certainly the Beethoven set to have. Even the packaging looks good; instead of the usual photo of the artist that we tend to get these days we get a water colour (by June Mendoza) of Mackerras sitting in his study looking content with the world. Anyone buying this set will probably look the same.